A man (Jake Gyllenhaal) awakens on a train not knowing where he is. The girl in front of him is Christina (Michelle Monaghan) and she thinks she knows him, even when he insists that he is actually an army pilot named Colter. Going into the bathroom he checks his appearance and sees that he has someone else's face. When the train explodes Colter awakens inside a freezing cold container. 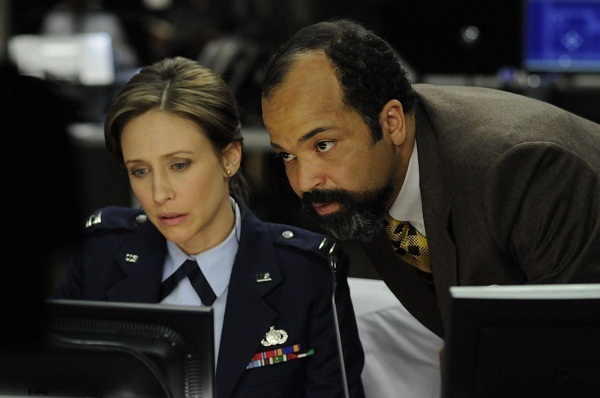 He's addressed on a computer screen by Colleen (Vera Farmiga), a military captain who explains that he is part of a program called Source Code. It's administered by Dr. Rutledge (Jeffrey Wright) and allows a person to inject themselves into someone else's body to relive the last eight minutes of their life. It is said not to affect the past but to address the future. As such, Colter's mission is to go back in time and find out who has placed a bomb on the train so that the bomber can be identified and stopped from setting off a second explosive in the city. 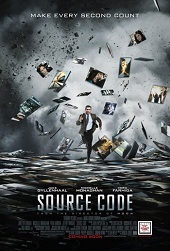 Source Code is a thriller that values its heart and its mind more than velocity or adrenaline. If Inception and Monsters gave hope last year for the intelligent blockbuster then this is the cherry on top. Working in the action genre, it's a more accessible film than Duncan Jones' leisurely paced sci-fi debut Moon. But with a solid screenplay from Ben Ripley, the depth and the intelligence have not been forgotten. This is a highly economical film, working in just a few locations and moving vigorously over its lean ninety minutes. Despite its brevity, the script has more interesting ideas than so many inflated blockbusters. Jones is concerned foremost about the misuse of technology but equally the paranoia that terrorism imposes on ordinary people: an intelligent and timely theme, which surprisingly gives way to brief moments of humour. The human responses from the passengers as Colter interrogates them, turning their bags inside out, are quietly funny. Even more fascinating is the way the film touches on how racial assumptions are born from paranoia, like when Colter stalks a man of Indian appearance and also the way soldiers are brainwashed to fight mentally off the battlefield. These are issues visualised with intensity and originality. As a science fiction piece the film is more of a jigsaw, with a few pieces missing. It's refreshing that the film throws viewers into the deep end, without lengthy expositional dialogue. For that reason it compels for much of its length, only to be marred by an ambiguous ending. It's a finale open to interpretation but not in the same satisfying manner as Inception's ending. This does little to detract from three impressive performances. Gyllenhaal is in fine touch, continually expressing his fear and his disorientation. The audience feels his claustrophobia most effectively through some tight close-up shots inside the container. He also holds the film's most touching moments, like Colter's fractured relationship with his dad, giving Source Code poignant thoughts about the last moments of our lives. And refreshingly for this genre, the women are dominant too. Monaghan is charismatic and has the most difficult role of balancing her normality and her skepticism. She succeeds accordingly. Farmiga is the most internal of the three but she's visibly conflicted about Colter's treatment because she's a solider too. Their relationship makes sense. Source Code has already been a huge box office success. I hope Hollywood will recognise this and continue to make more thrillers of similar merits.